Paws & Think and Talbots are hosting a fun night of shopping and refreshments on Thursday, Sept. 24 from 5-8 pm at the Keystone Mall (store is located between Pottery Barn and Nordstroms). the organization with 10% of all sales are donated to Paws & Think! So, stop on your way home from work, or grab a few friends and make it a girl’s night out! Shop for yourself and the dogs win too — that’s an easy reason to buy! Need a new outfit for the summer? Maybe a dress for a wedding or event? Or maybe you just need an excuse to go shopping! 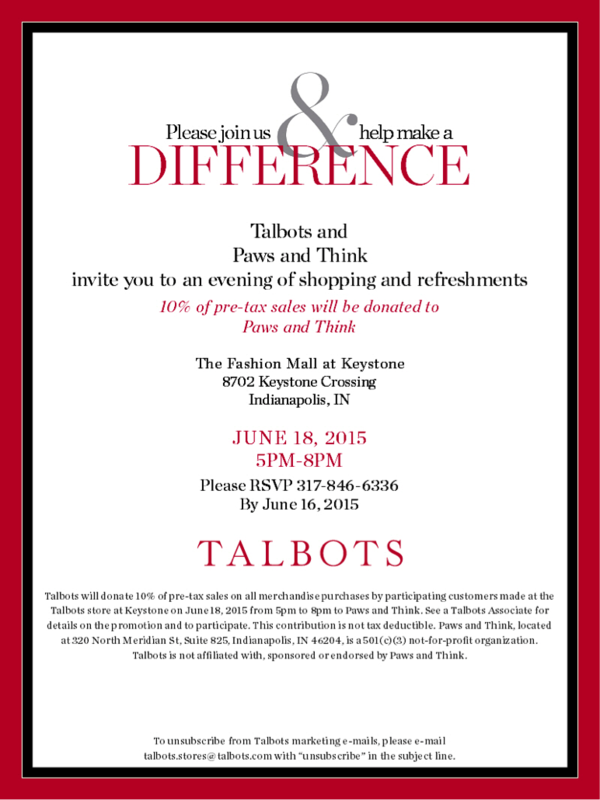 Paws & Think and Talbots are hosting a fun night of shopping and refreshments on Thursday, June 18 from 5-8 pm at the Keystone Mall (store is located between Pottery Barn and Nordstroms). Personal shoppers will be on hand too to help you select the right outfit! Paws and Think therapy teams will be there to greet guests and share more about the organization and 10% of all sales are donated to Paws & Think! So, stop on your way home from work, or grab a few friends and make it a girls night out! Shop for the dogs — that’s a pretty easy reason to buy! Click here to view the official evite from Talbots. 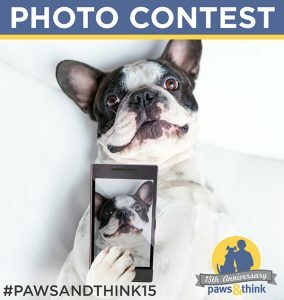 Join us at Milano Inn for an evening dedicated to Paws and Think. Enjoy a fun evening with other dog lovers in the outside patio and the lawn reserved for Paws & Think guests…and your dog! There’s even a FIDO menu for your best friend! A portion of all the food purchases that night will be donated to Paws and Think. 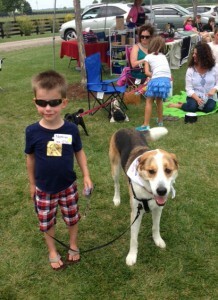 but please bring a photo of your therapy partner to add to our canine Hall Of Fame. Thank you gifts (for both two and four legged) and Special Awards will be presented. Come and sit, stay, fetch your prize, and have a treat.